Just because Cast Members where not yet using iPads, it didn’t stop us from getting good usage from ours. We used the iPads in the park two ways. One was when we had a chance to sit a bit, we used the Camera kit to pull images off of our camera’s SD card for a bigger screen view of our snaps. Many times what looked good on the digital camera screen was not as good once we saw it on the iPad’s larger screen. This gave us enough time to buzz back and grab another shot. The second usage was the app MouseAddict. The app comes in two versions, one for the iPad and one for the iPhone. Several of our party had the iPhone version while the iPads enjoyed the full power the hardware brings to the app. Basically, MouseAddict is just as it sounds, for fans of the ‘mouse’ and his ‘house’. 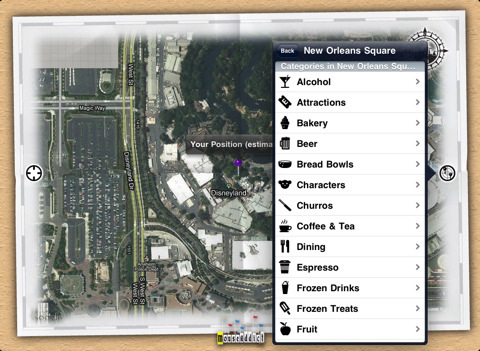 The app has data on all of the attractions and can help you zero in on what you want to see by showing you what is around the spot your standing. 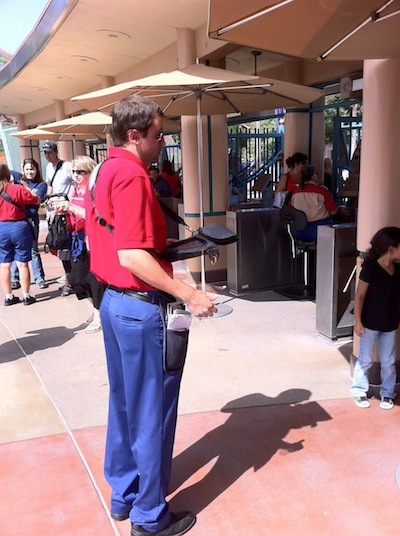 This can be important as Disneyland and California Adventure has a tendency to change as they update attractions. Those amongst us that really know the park didn’t need the ride maps and attraction notes, but did use it a lot to find the food and drink of their choice. We did find it a good idea to launch the app on all of our devices and go to the settings in order to download all of the google maps prior to needing it in the park. Doing this avoids the need for maps to download later when you do a search. 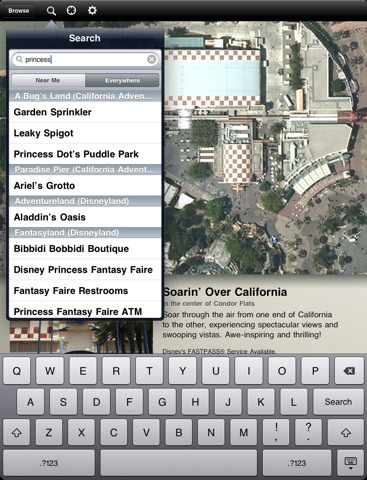 With aerial maps loaded, we hit the park and typed in what we were looking for on the go. Those on the team with 3G iPads got updated information every time they did a search, others with the WiFi only relied on data that loaded the last time they had internet access. MouseAddict comes preloaded with data, but the regular updates are important for keeping ahead of the changes. Like, the two Corn Dog carts in North California Adventure being closed meant the app directed us to the three spots in Disneyland.